Between 1880 and 1920 the first generation of Echo Hawk family members attended various race-based boarding schools in the United States. Today we retain only random glimpses of what this experience meant in their lives. But the social narratives that interpret the history of Indian boarding schools signify much in the contemporary practices of racial Indianhood. Recounting tragic tales of Indian boarding schools, racial Indians want accountability for the wrongs of an assimilationist history, but they are really building public spaces for racial bonding. This narrative is mythic; it is an origin story of pro-race pedagogy in the academic world. Progressive white Americans of the late 19th century and early 20th century deployed race to encircle racial Indians as a group. They then used the preferential ranking systems of racism to justify the imposition of their own value-driven notions of social engineering in Indian Country. As a racially designated educational system, Indian boarding schools affirmed the defining status of race in Indian Country. Race made life real in America. Racial identity was not optional; it was inevitable. For this reason, racial Indians responded to progressive white social engineering by embracing even tighter the clasp of race. And race had a proven record of generating social power. Perhaps this power could be useful to racial Indians in pro-race America. Indians were expected to defer to the storytelling bestowed upon them by progressive white intellectuals. But through the 20th century racial Indian storytelling about boarding schools took shape and gathered momentum. These accounts questioned the social engineering devised by progressive whites – the thinking that built Indian boarding schools as a social project. Pro-race Indian intellectuals took the empowering ingredients of racial bonding and crafted among themselves their own pro-race texts that justified an Indian racial bonding experience and validated the concurrent social polarization of race versus race in America. Enjoined to embrace the American race project, racial Indian boarding school students set their feet upon many diverse paths in life. But all these paths took them deep into the production of a pro-race narrative in the American social contract. With the rise of racial Indian boarding schools, a ceaseless flowing of racial bonding reshaped public life and personal identity in racial Indian communities. Racial bonding is useful as a practical source of social power when it establishes and exploits socially polarized racial oppositions. But racial bonding always involves the escalation of rigidly polarized certainties about the nature of life and humanity, as well as a consequent diminishing of useful ambiguities about the nature of humankind. In the history of race as an idea, the gathering of power through race always means that someone is about to get dehumanized. Race was freely embraced throughout Indian Country. It is also arguable that the promotion of race as a cultural system came at the expense of traditional lifeways, and that it is not coincidence that so many community cultural traditions withered among Indian tribes during this period. Formal acts of white suppression of racial Indian lifeways were common in that time. But Indians also made their own choices to selectively shape their lives and their cultural worlds. Resenting the way race operated in their worlds, racial Indians nevertheless often made the choice to further the making of race. The founder of the Carlisle Indian Industrial Institute was Richard Henry Pratt. Growing up in pro-race America during the mid-19th century, Pratt absorbed and completely accepted a dominant conception of race in his day. This was the idea that the human universe of social circumstances could be sorted and ranked in comparative cultural terms. Racial white people bestowed upon themselves a special status as inventers of superior “civilized” lifeways. But they ranked the cultural productions of racial Indians as inferior, as “savage” lifeways. Drawing from this view of culture, Pratt’s social project at Carlisle helped to perpetuate a stereotype of racial Indian cultures as primitive, trapped in an unsophisticated timeless stone-age past. This portrayal lingers still in American society. Pratt felt less amenable to a closely related major theme of raceology of the late 19th century. This was the idea that inherent racial biological characteristics accounted for the human cultural spectrum, and that racial whites enjoyed biological advantages that racial Indians lacked. In this model, racial Indians were a naturally doomed folk. They were locked into inferior social circumstances, unable to ever escape their primitive savagery. In the history of Anglo-American racialism, some practitioners of race-belief took this conception to mean that racial Indians could be categorized as subhuman or near subhuman, comparable to the Irish, ranked just above racial blacks. Before Pratt’s birth in 1840, this interpretation of race helped to justify US Indian removal policies. Pratt questioned this bioracial theory of human character. His progressive view was that racial Indians had the intellectual and moral capacity to escape their impoverished cultural chains. He set out to prove that racial Indians could usefully partake in the uplifting benefits of white civilization. Founding Carlisle, Pratt successfully implemented a national education project to demonstrate that racial Indians were not intellectually limited by any biological imperative of racial inferiority. Pratt’s agenda called for erasing racial Indian culture to facilitate assimilation into white America. This pro-race project attracted wide support in American society because the Gilded Age idea of Americanization similarly promoted social conformity by calling for rigorous adherence to American mainstream culture for all immigrant groups. This required acceptance of race as a belief system. All would believe. All would embrace the tenets of the American race project. Pawnees of the early 19th century embraced race. But this was necessarily a situational option of variable meaning – Pawnee identities remained centered on other non-racial social signifiers in the Pawnee world. By the end of that century, however, belief in race was pervasive in Pawneeland. 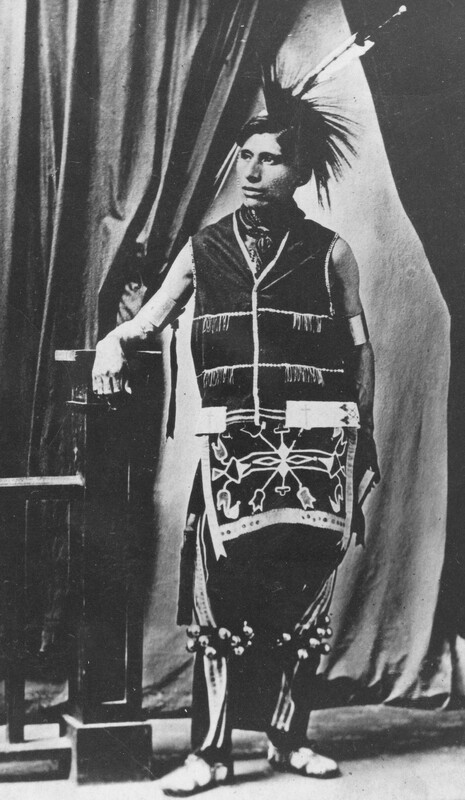 Imported from Europe and the United States, race slowly became indigenous as pro-race Pawnee Indians became fully entangled in the American race project. Race was not forced on the first generations of Pawnee boarding school students – their parents and grandparents handed down to them the basic tenets of racial Indianhood. All the Pawnees of the late 19th century absorbed race from their new racial Indian neighbors in Oklahoma, from the rise of pan-Indian religious movements like the peyote religion, and from American boarding schools. Racial Indianhood re-mythologized race and gave it a past, as if it had been invented in ancient times by Indian philosophers. 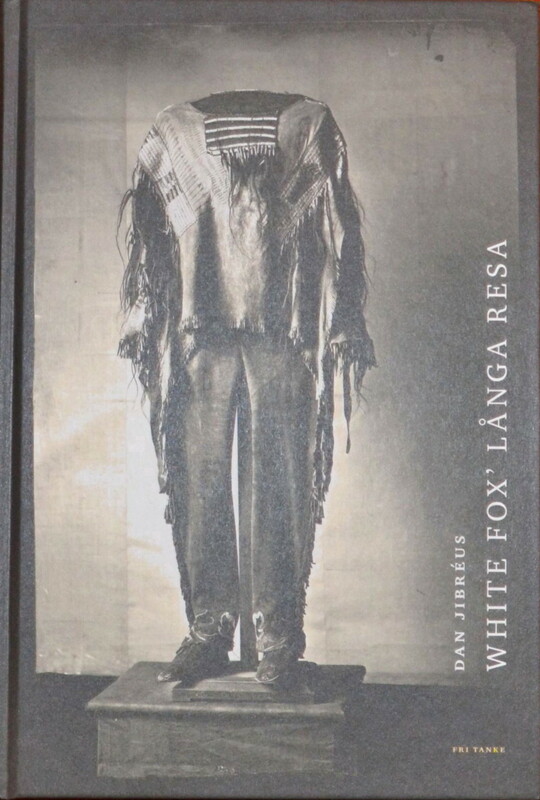 With this inheritance in hand, the first educated Pawnee Indians aimed at becoming literate in American culture, learning the narratives of racial identity that defined the American social contract. Pawnee Indian say that at night when the star are shining bright you can see two white lines cross the sky. They say that is where the horse and buffalo had a race. Indians say you can see lines which look like dust. One line which buffalo made is shorter than the other one. The shorter line was one made by buffalo and long one by the horse. The horse beat the buffalo and that is why there are more horses than buffaloes. The story is a variant of a Pawnee cosmogonical portrayal of the Milky Way and the mystery of human mortality. Elmer’s mention of “two white lines” seems to reference the Pawnee name for the Milky Way. It is notable that in this short text the word “Pawnee” appears once and the word “Indian” appears twice; by this time Elmer was a committed practitioner of race. The story sounds like an ancient Pawnee tradition, but in moving from a meditation on life and death to a race between a horse and a buffalo, the story has been adapted to appeal to a racial Indian audience. These sparse surviving records of Elmer’s life at Carlisle seem to point to a positive and constructive experience for Elmer at boarding school. But school records also list Elmer as a “deserter” who “ran” in July 1909. The details of this incident are not known. It occurred during his annual summer “outing” when he stayed with a local household – in this case, a man named John Philips of Titusville, New Jersey. So Elmer did not escape from Carlisle Institute; instead, he “deserted” from his assigned summer job. After leaving Carlisle in September 1910, Elmer briefly worked as a tailor in Oklahoma City. There he married Alice Jake on September 21, 1910. Their first child was a daughter named Minnie, born July 29, 1911. 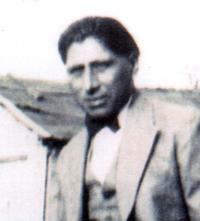 According to family tradition, the next year Elmer paid a man to build a house south of the town of Pawnee on several hundred acres of land, where he raised poultry and owned horses and farmed. 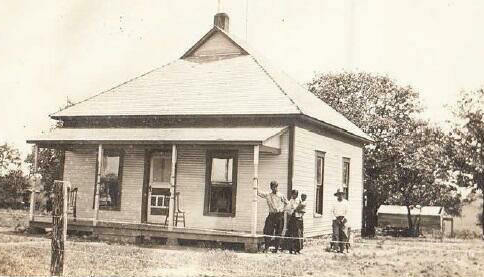 In the summer of 1912 Elmer obtained a photograph of his new home and family and he sent it to Carlisle. The photo shows Elmer, Alice, and Minnie, and another young man standing nearby – this was probably Elmer’s brother, George Echo Hawk, who was age 12 in the summer of 1912. 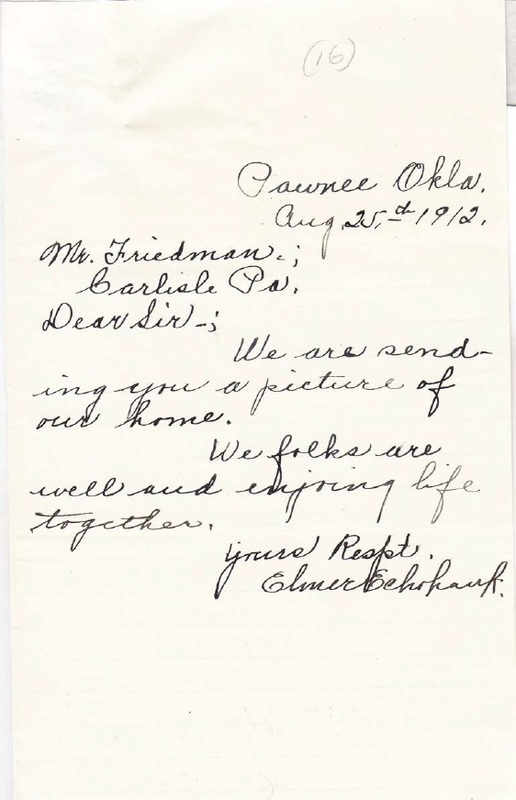 The accompanying letter is signed “Elmer Echohawk” (in 1924 and 1929 he signed his name as “Elmer Echo Hawk”). The fact that Elmer took the time to send his school this photograph seems to indicate that he did not feel particularly resentful or bitter about his experiences at Carlisle. Elmer passed down into family tradition just a few glimpses of his experiences at Carlisle. Elmer’s wife, Alice Jake, also attended Carlisle – her oldest son told me in 1982, “She said that she enjoyed the East and its culture.” There were surely some unpleasant experiences for both Elmer and Alice, but family tradition preserves very little, either good or bad, of those days. The full narrative of their lives, as it was handed down to me, appears below. and friend of Jim Thorpe, the famous athlete. was one of the best ice-skaters at Carlisle. because nobody had ever done that. and stick their bayonets out to look like thorns. so he did get a pension. we lived on that pension. and he was a good farmer. all the way through the Depression. He got thrown in jail for bootlegging. He was a real hustler! and he didn’t care much for white people. He’d fight them at the drop of a hat. he whipped the city marshal. causing him to lose his job or something. with the city police force. An old lady used to live around here. in the courtyard with three policemen. Foam even came out of his mouth. and hauled him off to jail. were sitting on the chutes. “I got to whip me an Indian today. I have to whip me an Indian. sitting there on the rails. and was waiting when the white man got there. into the chutes where they kept the horses. They told him to go home and die. So Elmer became a peyote man. run around anymore and raise hell. after my grandpa Echo Hawk died. because he was the oldest son. it is a respected name in the tribe. or Head of the Group. and they used to call him by that name. My mother was Alice Jake. She was from Pitahawirata, East Band. but only one close relative, a sister. None of her descendants are living today. where a man’s scalplock would be. you knew not to joke with them or talk to them. Alice did that when her sister died. and she was raised by older relatives. my mother used to write letters to one of her teachers. She said that she enjoyed the East and its culture. My mother also respected the Pawnee way of living. and her family had brought it down from there. the old lady suspected some white people. Alice was a pious woman. each one of us – especially when the corn came up. She had a lot of patience. he was a good provider. a girl who died in infancy.